I hope you can forgive my blogging absence…my boyfriend who was studying abroad a whole month in Paris just returned home last week so I’ve been catching up on lost time with him! However I have some really fun posts I’ve been working on for July so get ready for some great summer fashion ideas. One of my favorite trends this summer is the sheer look. 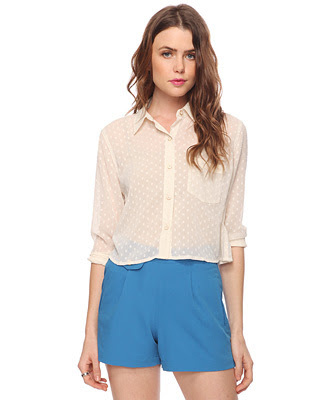 My outfit pictured below is going to be the beginning of many sheer outfits I will be posting about this summer. I recently went to Forever 21 and they have TONS of cute sheer tops right now so DEFINITELY be sure to check it out. I bought these long sleeve button down sheer tops (each for $13, in black and green) that are great paired with shorts (as I wore in my OOTN pictured below) or with long pants. They are also on the longer side so they would also look great untucked and belted. Of course I prefer to keep it classy and wear a shell underneath my sheer top (contrary to what Lady Gaga may think, there IS such a thing as showing too much skin)….. I absolutely LOOOOOOOVE this shirt! I bought it along with my green and black button down sheer shirts. Definitely expect an OOTD/OOTN post soon. Also my sweet boyfriend got me the Longchamp bag pictured above. I have always wanted one of these handbags and my sweet boyfriend surprised me with one that came all the way from Paris. The history behind the Longchamp brand is really interesting (thanks to THIS Wikipedia article)! They were founded in 1948 and began as a company creating products for smokers (such as leather coverings for pipes) but by 1980 they had expanded to produce scarves, clothes and various other accessories. The bag I have (check it out HERE) is part of the very popular "Le Pliage" line which Longchamp has to thank for expanding to new markets such as those in the US. It comes in a few different colors (I love the white, a nice summer bag!) and styles/sizes. I hope everyone is having a great weekend! Thanks for reading dolls! Recent OOTDs: A little bit of this and that! Minnie Mouse Collection by OPI!